Remember when we were kids and we’d jump on the bed? Maybe if our parents had known the vast amount of benefits that come from that jumping up and down motion, they wouldn’t have yelled at us to stop! Let’s talk about the adult version of jumping on the bed, it’s called rebounding. Rebounding is just a fancy title for, ‘’mini trampoline.’’ You can rebound anywhere from 5 minutes to as long as your heart desires. 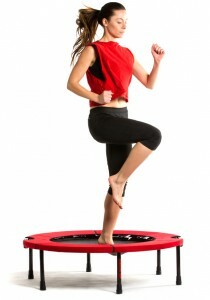 The most commonly known benefit of rebounding is the stimulation of your lymphatic system. Your lymphatic system is like your body’s internal filtration system. It’s job is to filter your blood and dispose of acidic and toxic waste. Without it our cells, tissue and organs would become overloaded with toxins. A sluggish or unhealthy lymph system could lead to a weakened immune system, chronic fatigue, aches and pains, bloating, cellulite, your body collecting fat deposits, poor digestion, fibromyalgia and so much dang more. Rebounding for just 5-15 minutes a day can increases the circulation of your lymphatic system by 15-30 times! All of that just from jumping on a trampoline for a few minutes a day? Hell yeah! Now go rebound. You’ll do something amazing for your health, and, rebounding is quite joyful. Something about just jumping up and down is fun and freeing. It really helps release the inner child in you and who knows, that happy inner child may provide you with some much-needed perspective.